We know that avocados are full of nutrients and that they are a fat-burning SuperFood, so now we can become playful in how we eat this delicious and creamy fruit (yes, it’s a fruit!). Stuffed avocados make for great snacks–even meals. One way people trying to cut down on carbohydrates can really make use of avocados is by filling the seed pit with what they’d normally place between bread in a sandwich. The great part of it is that avocados are filling, so you won’t miss the bread all that much. Sometimes, the most amazing innovations with food are the simplest. This is definitely true for the avocado ideas we’ve listed for you. Use your favorite recipe, preferably using extra virgin olive oil rather than mayonnaise and fill her up! Now you can have your salsa inside your avocado for easy dipping. This is a great idea if you’re feeling too lazy to make guacamole. 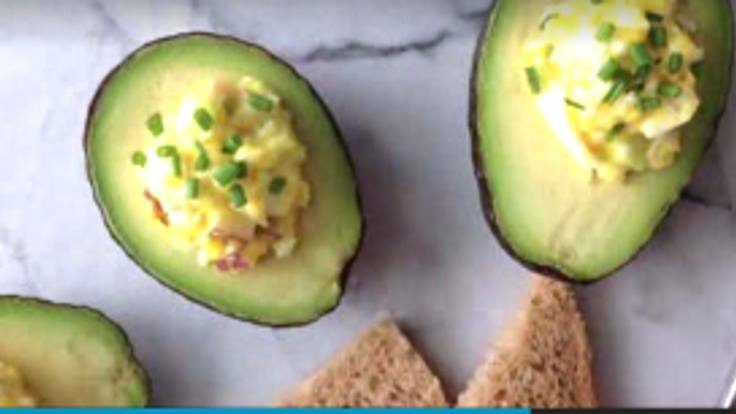 Egg and avocado go great together. Crack a small egg and place in the avocado and bake. Tuna goes surprisingly well with avocados. Great idea, right? Again, you can use your favorite egg salad recipe, but it’s worth trying extra virgin olive oil rather than mayonnaise. You can pretty much add all the toppings you like to make Fiesta Avocados . Heat up the beans first, add the salsa and enjoy a tortilla-less burrito!